As noted before, pre-season training is all about player morale, match fitness, blending and tactical familiarity. Once the above is completed (usually done by the first league match of the season, sometimes a little longer), I refocus "in-season" training to concentrate on player development. Individual training plans play a full part in this, although I've already set this up during pre-season. Note - if this isn't your cup of tea, you can always head into Staff Responsibilities and task one of your team to take care of it. It's important to remember that different Training selections will develop different player attributes, and this will affect everyone in your team. 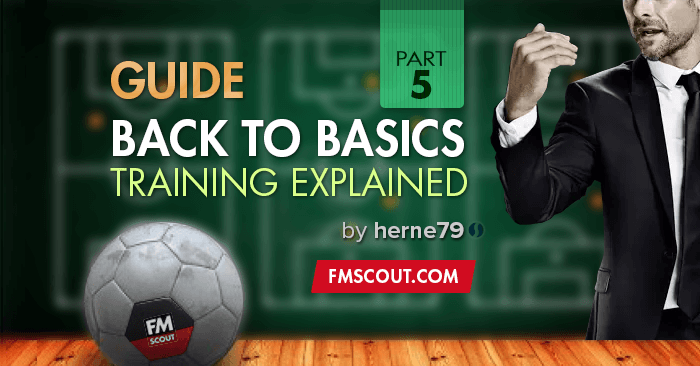 Training has been completely overhauled for FM19! It is possible to take as big or as small a role in training as you wish. The Assistant Manager is fully qualified to run training in your absence, he will base his decisions on your tactics, the time of season and his own attributes and preferences. Taking control yourself allows you to set training from our extensive list of templates on the Training > Calendar page or delve into each and switch one session for another, creating bespoke schedules for the situation at hand. The Assistant always sets training up ahead of time for you, so if you wish to have him mostly run it but dip in and tweak here and there you absolutely can. The easiest way of doing this is directly from the weekly training preview news item that you will receive each Sunday evening. You can even create your own schedules from scratch on the Training > Schedules page and apply them to the Calendar months in advance. The more specific you wish to be with training the more specialised of a squad you can craft. Training has both short term - the upcoming match - and longer term - player development and attribute growth - influences. The best piece of advice is to take your time, learn the system and try to get inside the head of a real manager! Training is run weekly via Schedules. Each schedule is made up of Sessions. There are 3 sessions per day, Session 1, Session 2 and Extra. Each session is available for training in a wide variety of exercises, from general team Outfield work to specific Chance Conversion work and even Team Bonding. The team is split up into training Units. These are Goalkeeping, Defensive and Attacking. By default players are placed into the most suitable unit for them; strikers into Attacking, centre backs into Defensive, etc. It is possible to move a player from one unit to another. It is also possible to promote a youngster from the youth or reserve team into a senior unit, where he will train on the senior schedule. The unit a player is in defines what part he takes in each training session. Sessions are training exercises run on general or specific ares of the game. Sessions are either performed as a whole team or in units. Each session has Impacts. These are how the sessions will affect the players. Each session has various impacts, including the attributes it influences, any tactical familiarity gained, the risk of injury during said session and so on. Each session can have up to three focuses, Primary, Secondary and Tertiary. Each focus will receive a different amount of attention, and as such the impacts will both differ in type and weighting. When training in units, each unit receives a different focus. As such, some units may receive 60% of the coaches' attention whilst another may only receive 20%. Whilst team sessions are performed as a whole group, there can still be different focuses. For example, 'General > Attacking' sees all Outfield players (that is the Attacking and Defensive units) train together, switching places during the session to allow both attack and defence. As such, all players receive 60% focus on attacking attributes, such as Crossing, Dribbling, etc., and 20% focus on defensive attributes, such as Marking, Tackling, etc. The Goalkeeping unit receives 20% of the focus on their specific GK impacts. Training that is split into positional units has one unit work against the other to complete the exercise, with a certain unit being the main focus of the session. For example, 'Attacking > Attacking Wings' sees the Attacking unit as the main focus of the session, receiving 60% of the attention, meaning a 60% focus on the attributes and impacts listed, such as Anticipation, Finishing, etc. and the associated impacts, such as a slightly increased injury risk. The Defensive and Goalkeeping units work to defend against the Attacking unit and whilst they are not the main focus of the session, they still receive 20% of the attention each, meaning a 20% focus on their relative attributes and other impacts. Each session has various impacts, as discussed above. Some of these impacts are things like Injury Risk and Condition. Intensity is Injury Risk + Condition. Each day in the schedule has an Intensity associated with it, the combination of Injury Risk + Condition for all three sessions that day. This is measured against the %age of an average match. Only match days would be expected to hit 100%. Only the most intense training would exceed this, with most training days falling comfortably below 100%. Intensity can be measured for each individual unit or the team as a whole. Mentoring is how more influential players in the squad pass on their experience to younger players. Mentoring allows the manager to group players together for the purpose of sharing Player Traits (PPMs) and passing on desirable (or undesirable) personality traits. Players must be in the same squad to mentor one another and each group must consist of at least 3 players. A good starting point is one experienced professional that is a social leader grouped with several younger up-and-coming players that play in a similar position. It is also possible to set up a short period of one-on-one mentoring via the 'Welcome to club' interaction on signing a new player. This will invite a current player to mentor the new signing off the pitch for a short period of time and ease his transition into his new group of teammates. This affects personality and settling at the club only, no Player Traits (PPMs) are passed. Individual training has moved in a more realistic direction. Complimentary attributes are now grouped together, where it would be impossible to train one without influencing the other. Some attributes are no longer available under individual training. This is because it is not realistic to be able to train these on a one-on-one basis. They are included in the team and unit training sessions however. Goalkeepers have no Individual > Additional Focus. Instead they have their own bespoke training sessions available in the schedule. Crossing - this is more dead-ball crossing, so Free Kicks and Corners. Open-play crossing is prevalent in quite a few of the team/unit training sessions. Dribbling - dribbling around cones in isolation isn't reflective of actual in-match dribbling and not something that is done in reality to improve dribbling. Remember, if you are going to change Training around during the season, leave each Training area in place for at least 3 months at a time in order for it to have any kind of meaningful impact. It is advisable to run a proper pre-season, whether this be from our list of pre-season templates or your creating your own. If left to the Assistant, he will run pre-season according to his preferences. During pre-season players will most likely be at their minimum level of fatigue, the exception being those returning from summer international duty. When fatigue is low a player that works hard physically (sessions that increase fatigue) will improve his long term fitness, meaning he can stave off jadedness longer into the season. However, when a player is already becoming fatigued, sessions that are overly physical (increase fatigue) will tire the player further, meaning he will eventually become jaded. As such, if you run a proper pre-season the players will remain fitter and last longer into the season proper. Under-working the players in pre-season or over-working the players during the season itself will lead to fatigue. Of course, too much physical work at any time raises the risk of injury, but this can be an acceptable trade-off if you wish to work the players hard. Pre-season is also a great time to work on those physical attributes that simply cannot be worked on in any great amount during the season itself due to the fixture schedule. It is important to have a Match Preview session before each match, this contains the Pre-match Briefing. It is also important to run a recovery session after a match and/or allow the players some rest. This is important for regaining condition and staving off injury and fatigue, especially during busy periods. Other than during pre-season or periods of deliberately working the players hard, say a week with no match, it is not advisable to run more than 2 sessions per day, leaving the Extra sessions as rest. 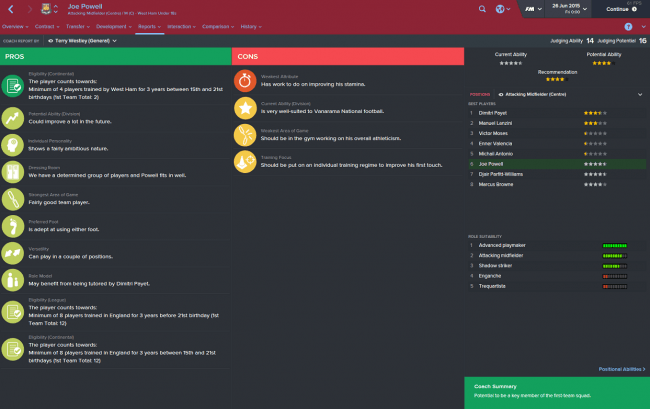 This next part was written in 2016, long before the changes introduced with FM19. Rather than just speak in general terms of methods to go about developing young players, I thought it might be more interesting to do a case study of taking one player and looking at my thought process of starting him off on the long road to stardom (hopefully). Now it is of course perfectly feasible to just go back to your Staff Responsibilities at this point and let one of your staff deal with training and/or player development. If that side of the game doesn't interest you, then not a problem - do the things that you find fun and forget the rest. And you know what? Your players will still turn out to be alright. For me though, "alright" isn't quite good enough, so I take charge of things. 1) Potential. 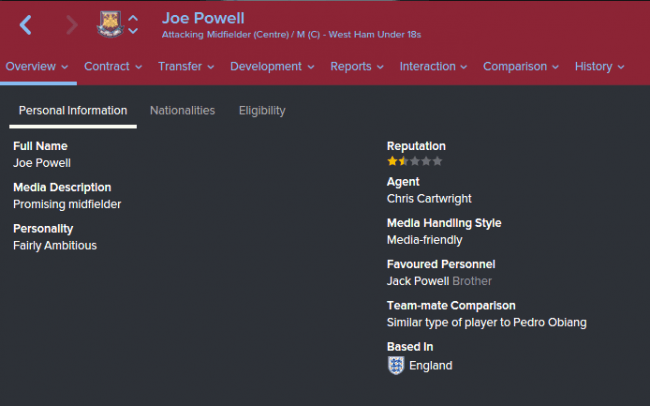 According to my coach report, he has loads of potential. However it's important to understand the star ratings are (i) only as good as the coach's own judging ability and (ii) is only a comparison against other similar players at my club. So he may not be quite as good as initial impressions, but it's a starting point. 2) Pros and Cons. Always useful to have a quick read through of your coach opinions, but again do not rely on it. You'll notice at the top you can select which coach you want to see the report from, and they will differ. I've selected the report from my coach with the best judging ability, so it should be at least ok. The Cons I'm not paying too much attention to here as the kid is only 16 and things like the mentioned stamina and athleticism issues will improve naturally over time. I'll keep an eye on how these related attributes develop and change his regime if needed. 3) Attributes and Personality. If Joe is going to have a long term future at my club, he needs to fit in with my DNA (Aggression, Work Rate, Stamina, Decisions, First Touch). Looking at his attributes, Aggression worries me (it's just 5). Aggression cannot be specifically trained, so to increase this I'm going to have to get creative with which role I train him in, as not many roles will look to train Aggression as part of their plan. I'll also have to cross my fingers a bit and hope it improves naturally over time. Looking at his personal information, he has a personality of "Fairly Ambitious" and a Media Handling Style of "Media Friendly". If you want a very detailed explanation of how to read these traits, check out "The Ultimate Personality / Media Handling Guide". If any player is going to stand a chance of reaching their potential, they need the right personality traits. To train well, they need high level of Professionalism and (to a lesser extent) Ambition. Joe's personality leads me to believe he has decent levels of Ambition, but he needs a boost of Professionalism. As he is "Media Friendly", he should also be fairly uncontroversial and have a decent temperament so I shouldn't worry too much about him bitching about stuff. So, I need to change his personality to improve the chances of him reaching his potential, and the only way I can do that is to Tutor him. And to do that, I need to find a senior player who does have the right qualities which he'll (hopefully) pass on to Joe. NOTE - Determination will also be passed on during Tutoring. This is an important attribute when playing matches, so whilst selecting a Tutor for Joe, not only does the Tutor need a good personality, but also decent levels of Determination. The player I therefore select as my Tutor for Joe is my club captain, Mark Noble. Mark has a great personality (Model Professional) and decent levels of Determination (15). In my opinion he's a great role model for Joe and I'll get the two of them working together straight away. I need to decide where I ultimately see Joe fitting into my team. As he's just 16, he's young enough for me to start training him into any position and role I want to. 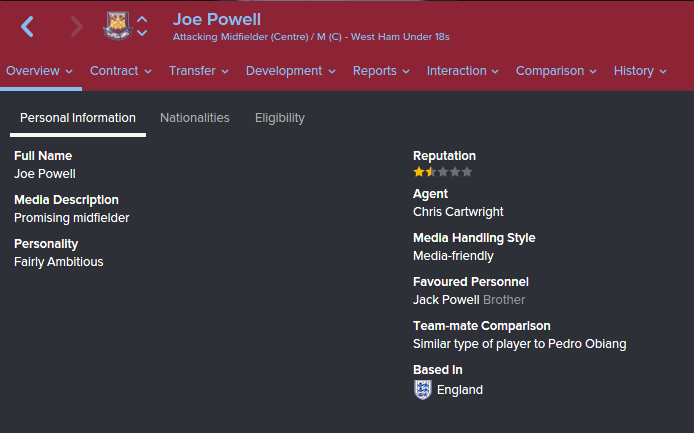 Given some of his attributes and standing 187cm tall, he might make a decent central defender for example. 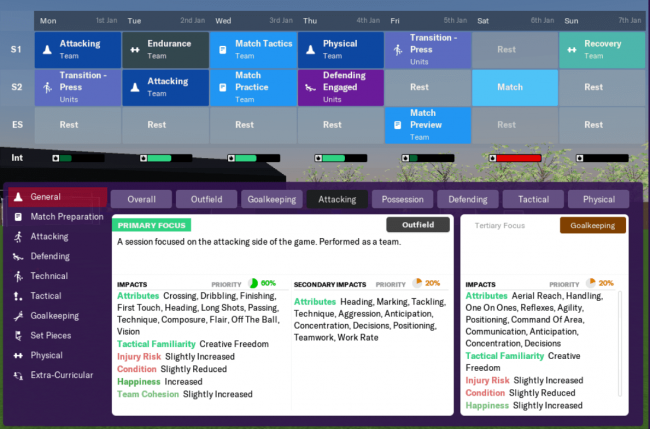 However, he's already proficient in the MC and AMC positions, and as I see my Central Midfielder (attack) in my 4123DM tactic also doubling up as my Attacking Midfielder (support) in my 4231 tactic, I'll keep him training in these positions. Here's the thing to remember - just because you select a certain role in Training, doesn't mean to say that's how you'll play the player in your team. Use the roles in Training to simply train the attributes that you want the player to develop. So, clearly I don't have room in my tactics for a Shadow Striker or a Ball Winning Midfielder, but look at the attributes that will be trained and think about the roles that Joe will carry out in my team. As a CM(a) / AM(s), I want him being a creative goal threat from deep, willing to get up and down the pitch and help out in both attack and defence. So going by those two Training roles, what if I could somehow combine them? The Shadow Striker training is going to help him move around aggressively in attack, and the BWM Training role will help his defensive work. That sounds perfect to me. To do this, I'll set him on a 6 month rotation - for 6 months he'll train as a BWM, for the other 6 he'll train as a Shadow Striker. I can even use the in game Notes function to send me a reminder every 6 months to swap things around so I don't have to rely on remembering. For an "Additional Focus", I'll set this to First Touch. Part of my DNA and an area that needs a boost. And what about a PPM or two? For now I'm going to hold fire on that until I've watched my tactics play out a bit, which should help me decide what (if anything) may be useful. That covers this case study here, which I hope you found interesting. I wanted to show how it's possible to apply a little creative thinking to training plans without resorting to the "I've got a DLP so I'm going to train him as a DLP" mindset. There are of course other methods of setting up training plans, this is just my personal take.